He is known for such paintings as Jupiter and Antiope and La Toilette. Watteau was born in the town of Valenciennes, which had recently passed from the Spanish Netherlands to France. His father was a master tiler. Showing an early interest in painting, he was apprenticed to Jacques-Albert Gérin, a local painter. Having little to learn from Gérin, Watteau left for Paris in about 1702. There he found employment in a workshop at Pont Notre-Dame, making copies of popular genre paintings in the Flemish and Dutch tradition; it was in that period that he developed his characteristic sketchlike technique. In 1703 he was employed as an assistant by the painter Claude Gillot, whose work represented a reaction against the turgid official art of Louis XIV's reign. In Gillot's studio Watteau became acquainted with the characters of the commedia dell'arte (its actors had been expelled from France several years before), a favorite subject of Gillot's that would become one of Watteau's lifelong passions. Afterward he moved to the workshop of Claude Audran III, an interior decorator, under whose influence he began to make drawings admired for their consummate elegance. Audran was the curator of the Palais du Luxembourg, where Watteau was able to see the magnificent series of canvases painted by Peter Paul Rubens for Queen Marie de Medici. The Flemish painter would become one of his major influences, together with the Venetian masters he would later study in the collection of his patron and friend, the banker Pierre Crozat. In 1709 Watteau tried to obtain the Prix de Rome and was rejected by the Academy. In 1712 he tried again and was considered so good that, rather than receiving the one-year stay in Rome for which he had applied, he was accepted as a full member of the Academy. He took five years to deliver the required "reception piece," but it was one of his masterpieces: the Pilgrimage to Cythera, also called the Embarkation for Cythera. Interestingly, while Watteau's paintings seem to epitomize the aristocratic elegance of the Régence (though he actually lived most of his short life under the oppressive climate of Louis XIV's later reign), he never had aristocratic patrons. His buyers were bourgeois such as bankers and dealers. Although his mature paintings seem to be so many depictions of frivolous fêtes galantes, they in fact display a sober melancholy, a sense of the ultimate futility of life, that makes him, among 18th century painters, one of the closest to modern sensibilities. His many imitators, such as Nicolas Lancret and Jean-Baptiste Pater, borrowed his themes but could not capture his spirit. Among his most famous paintings, beside the two versions of the Pilgrimage to Cythera (one in the Louvre, the other in the Schloss Charlottenburg, Berlin), are Pierrot (long identified as "Gilles"), Fêtes venitiennes, Love in the Italian Theater, Love in the French Theater, "Voulez-vous triompher des belles?" and Mezzetin. The subject of his hallmark painting, Pierrot or Gilles, with his slowly fading smile, seems a confused actor who appears to have forgotten his lines; he has materialized into the fearful reality of existence, sporting as his only armor the pathetic clown costume. The painting may be read as Watteau's wry comment on his mortal illness. Watteau's final masterpiece, the Shop-sign of Gersaint, exits the pastoral forest locale for a mundane urban set of encounters. Painted at Watteau's own insistence, "to take the chill off his fingers", this sign for an art shop in Paris is effectively the final curtain of Watteau's theatre. It has been described as Watteau's Las Meninas, in that the theme appears to be the promotion of art. The scene is an art gallery where the façade has magically vanished. The gallery and street in the canvas are fused into one contiguous drama. Watteau alarmed his friends by a carelessness about his future and financial security, as if foreseeing he would not live for long. In fact he had been sickly and physically fragile since childhood. In 1720, he travelled to London, England to consult Dr Richard Mead, one of the most fashionable physicians of his time and an admirer of Watteau's work. However London's damp and smoky air offset any benefits of Dr. Mead's wholesome food and medicines. 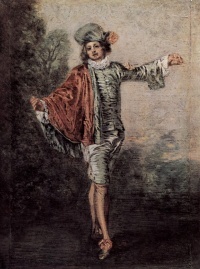 Watteau returned to France and spent his last few months on the estate of his patron, Abbé Haranger, where he died in 1721 perhaps from tuberculous laryngitis at the age of 36. The Abbé said Watteau was semi conscious and mute during his final days, clutching a paint brush and painting imaginary paintings in the air. Little known during his lifetime beyond a small circle of his devotees, Watteau "was mentioned but seldom in contemporary art criticism and then usually reprovingly". (Arnold Hauser) Sir Michael Levey once noted that Watteau "created, unwittingly, the concept of the individualistic artist loyal to himself, and himself alone". If his immediate followers (Lancret and Pater) would depict the unabashed frillery of aristocratic romantic pursuits, Watteau in a few masterpieces anticipates an art about art, the world of art as seen through the eyes of an artist. In contrast to the Rococo whimsicality and licentiousness cultivated by Boucher and Fragonard in the later part of Louis XV's reign, Watteau's theatrical panache is usually tinged with a note of sympathy, wistfulness, and sadness at the transience of love and other earthly delights. Watteau's influence on the arts (not only painting, but the decorative arts, costume, film, poetry, music) was more extensive than that of almost any other 18th-century artist. According to the 1911 Britannica, "in his treatment of the landscape background and of the atmospheric surroundings of the figures can be found the germs of Impressionism". The Watteau dress, a long, sacklike dress with loose pleats hanging from the shoulder at the back, similar to those worn by many of the women in his paintings, is named after him. A revived vogue for Watteau began in Europe during the Victorian era and was later encapsulated by the Goncourt brothers and the World of Art. In 1984 Watteau societies were created in Paris and London. Since 2000 a Watteau centre has been established at Valenciennes. La Surprise, painted around 1718, was known only through a copy in the Royal Collection before the original was found during a routine insurance valuation in 2007. The oil painting shows an actor playing a guitar on a stone bench looking across at a couple locked in an amorous embrace. The action is watched by a small dog in the corner. The painting was sold at auction on July 8, 2008 for 15 million Euros; this set a world record price for a painting by Watteau. The son (Louis Joseph Watteau) and grandson (François-Louis-Joseph Watteau) of Antoine's brother Noël Joseph Watteau (1689-1756) both also became painters. Unless indicated otherwise, the text in this article is either based on Wikipedia article "Antoine Watteau" or another language Wikipedia page thereof used under the terms of the GNU Free Documentation License; or on original research by Jahsonic and friends. See Art and Popular Culture's copyright notice. This page was last modified 11:50, 10 October 2014.